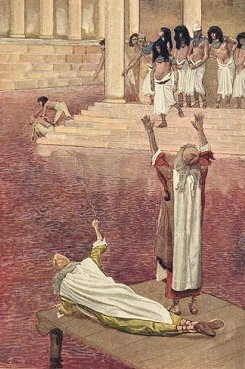 According to the Old Testament account in the book of Exodus, when the pharaoh refused Moses’ demands to let the Israelite slaves leave Egypt, God inflicted the Egyptians with a series of what the Bible calls plagues, which included darkness over the land, the Nile turning to blood, fiery hail storms, cattle deaths and a plague of boils. 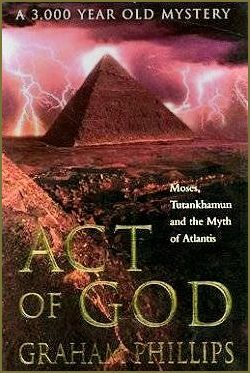 In Act of God, Graham presents compelling evidence that these biblical plagues were real historical events - the result of a volcanic eruption so colossal that it also gave rise to the legend of Atlantis. Photograph of the 1980 Mount Saint Helen’s eruption by Craig Byron from Enumclaw, Washington State. There are various types of volcanic eruption: some spew forth rivers of molten lava, others produce searing mud slides, but by far the most devastating is when the pressure of the magma causes the volcano to literally blow its top. 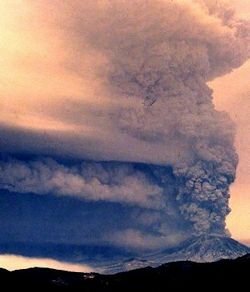 One of the largest eruptions in recent years was the Mount Saint Helens eruption in Washington State USA in 1980, when the explosion blasted away the mountainside with the power of a fifty megaton bomb. On the morning of 18 May 1980, a mass of searing volcanic material blasted outwards, killing almost every living thing or miles around. Thousands of acres of forest were flattened and molten debris covered everywhere like the surface of the moon. Within a few hours a cloud of ash thousands of feet high, containing billions of tons of volcanic material, had rolled east across three states - Washington, Idaho and Montana – where the massive volcanic cloud covered the sky and day was turned to night. Throughout the whole area ash fell like rain, clogging motor engines, halting trains and blocking roads. Thousands of square miles of lush farmland now looked like a grey desert and millions of dollars worth of crops were destroyed. Hundreds of people, as far away as Billings in Montana, over 500 miles from the volcano, were taken to hospital with sore eyes and skin rashes caused by exposure to the acidic fallout ash. For weeks afterwards fish in thousands of miles of rivers were found floating on the surface, killed by chemical pollutants in the water. Something very similar seems to have affected Egypt some three and a half thousand years ago when the Exodus story appears to be set. Map showing the huge area covered by fallout ash after the Mount Saint Helens eruption. 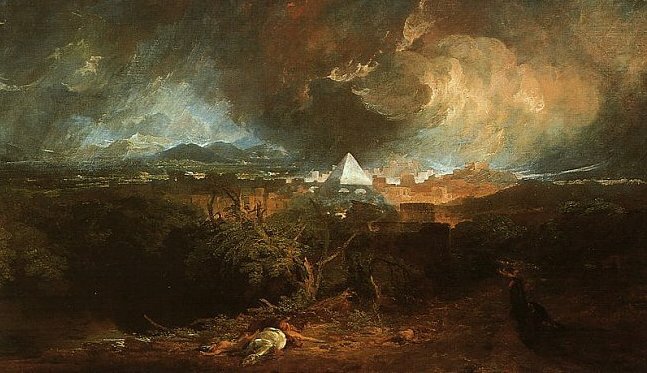 The Plagues of Egypt painted by Joseph Turner in 1800. And there was thick darkness in all the land of Egypt three days: They saw not one another, neither rose any from his place for three days. 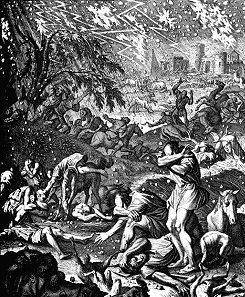 And the Lord sent thunder and hail… So there was hail and fire mingled with the hail… And the hail smote all throughout the land of Egypt, all that was in the field, both man and beast, and brake every tree in the field. This would be an accurate description of the dreadful ordeal suffered by people in the shadow of the Mount Saint Helens fallout cloud in 1980 - pellet-sized volcanic debris falling like hail; fiery pumice setting fires on the ground and destroying trees and houses; lightning flashing around, generated by the tremendous turbulence inside the volcanic cloud. For days volcanic debris fell like hailstones, flattening crops for miles around. And all the cattle of Egypt died. And the fish that was in the river died: and the river stank, and the Egyptians could not drink of the river, and there was blood throughout all the land of Egypt. And all the waters that were in the river turned to blood. (Exodus 7:20). Over the years various scholars have individually attributed these plagues to different natural phenomena. The darkness could have been due to a violent sandstorm; the hail the result of freak weather conditions; the boils caused by an epidemic; and the bloodied river may have been the result of seismic activity to the south, near the Nile’s source. However, the likelihood of them all happening at the same time seems just too remote. A volcanic eruption, however, would account for them all. The plague of hail by an unknown eighteenth-century illustrator. 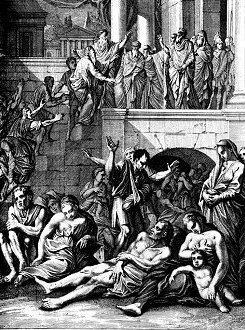 The plague of boils by an unknown eighteenth-century illustrator. The Plague of Blood painted by the French artist James Tissot in 1896. There have been no known volcanoes in Egypt in recent geological times, but a large enough eruption to have afflicted the country did occur on the Mediterranean island of Thera sometime around the period in question. Today Thera is a crescent-shaped island, now called Santorini, forming a bay over six miles across. The bay itself is actually a crater formed by the ancient eruption and in the 1930s the Greek archaeologist Spyridon Marinatos was the first to propose that sometime around 1500 BC a gigantic volcanic eruption had all but destroyed the island. Going by the size of the crater – over thirty square miles - the Thera eruption has been estimated to have been over twenty times bigger than the Mount St Helen’s eruption. Moreover, from ancient pumice samples taken from the seabed it has been determined that the prevailing wind had been blowing in the direction of Egypt. The Egyptian coast is less than 500 miles from Thera; almost certainly the volcanic cloud covered much of the country.